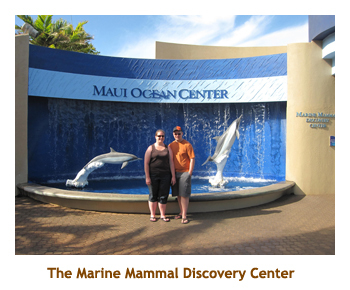 I had finally convinced Marjorie to do a trip to Maui, so we were able to organize a two week trip for the whole family (all 6 of us). 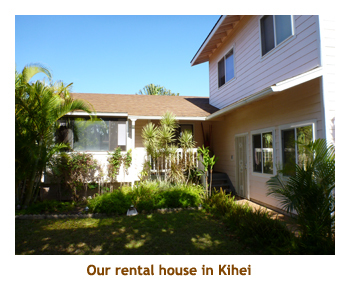 We located a 3 bedroom house in Kihei that was reasonably priced - less than $100 per couple per night. Can't beat that! The house was in a subdivision about 3 blocks from the ocean, but that was just fine. This would be the first time that all 6 of us toured together. 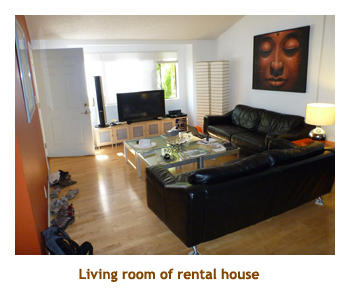 We booked a Dodge Caravan which worked out great and the house was quite comfortable for 6 people. 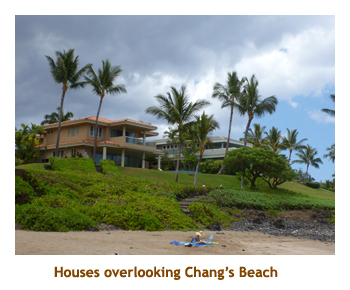 In 2009, 5 of us had stayed at a 3 bedroom condo at the Kona Coast Resort complex on the Big Island. The one advantage there was the huge swimming pool which we used every day. We didn't have that at the house. I think I would go for the condo complex instead of a house. This was also the first time that C&M were able to spend the entire vacation with us rather than popping down just for a week. And, it was the first time that C&M were going to join us snorkeling. 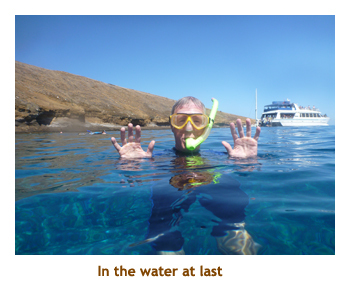 It was exciting that they would be experiencing the underwater sights that we have enjoyed so much for many years. It was going to be great! We left the house and headed for the airport about 9:30 AM. All 6 of us were flying on the same flights. The first leg of the trip left a bit late from Calgary, so we had a tighter connection in LA. We had to change terminal buildings in LA (which was a bus trip) and were processed through security as the plane was loading. We had to run to the gate. Close call! 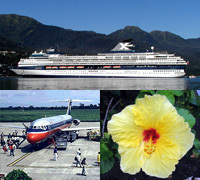 However, we were ontime to Maui and arrived mid-afternoon. 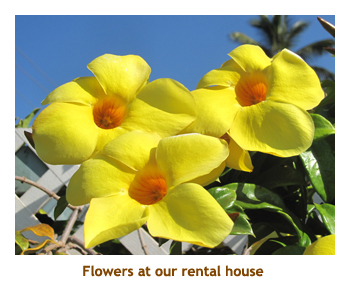 We picked up our rental van from Budget and then drove to the house in Kihei. It was nice being able to navigate in the daylight. We drove to a nearby strip mall to get groceries (Star Markets and Time Groceries) and found a small Vietnamese restaurant for dinner. Very good! Then we headed back home to unpack and retire to bed. 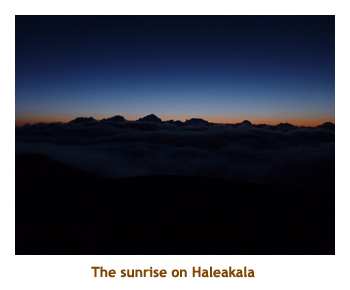 It was Chrissy's idea to do a Haleakala sunrise trip on our first day as we would be waking up early on Calgary time. We arose at 3:00 AM and headed off to the mountain. M&S's friends Jeremy and Zabine (who happened to coincide with us on Maui) joined us in the van (Marjorie didn't come). It was a 2 hour drive in the dark and we arrived at the summit about 5:00. It was cold! The sunrise was awesome and soon it was daylight (and warmer). We wandered around a bit in the sunlight and then headed back down the mountain. We were back to the house by 10:00. 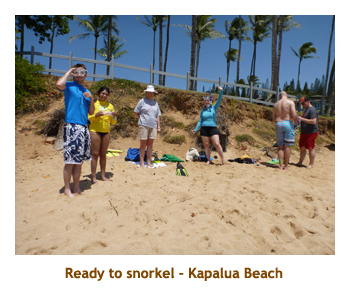 We had an early lunch and then drove up to Kapalua Bay for a snorkel. It's a beautiful beach, but the water was quite murky and there weren't a lot of fish. We've been there before when the snorkeling was excellent. On our way back to the house we stopped at Whaler's Village and perused the shops. 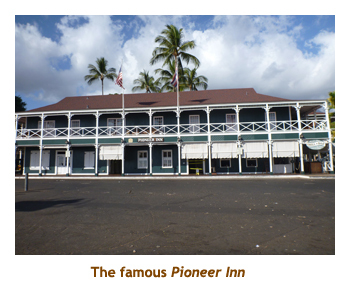 We made another stop in Lahaina and walked around Pioneer Square area. 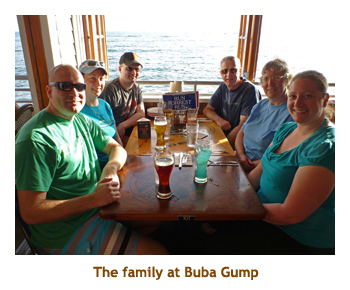 We had dinner at Buba Gump which is always good. The kids finished off with some shave ice. Then it was home to bed. We were up early for breakfast (still on Calgary time). J&Z met us at the house and we drove south to Malu'aka Beach in Wailea for a morning snorkel. 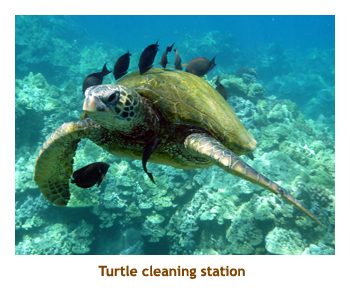 There were lots of turtles and fish - an excellent snorkel! We returned home for lunch and J&Z headed off to do their own thing. 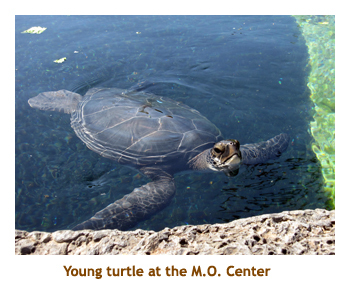 After lunch we drove up to Ma'alaea Harbour to the Maui Ocean Center. We bought the monthly pass so that we could visit throughout our stay and not be concerned about "getting our money's worth" each time we were there. It really is a wonderful aquarium. On our drive home we picked up some more groceries. In the late afternoon the kids headed off to Lahaina with J&Z for a luau. They said it was really excellent. Marjorie and I bought a BBQ chicken from the nearby Safeway and had our own luau. We were asleep by the time the kids arrived back home at 10:40 PM. Another early morning and early breakfast. I think that J&Z were flying home this afternoon. 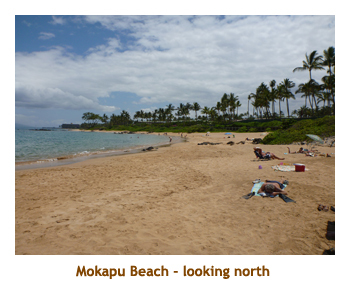 Today we were heading south to Wailea to snorkel at Ulua Beach. 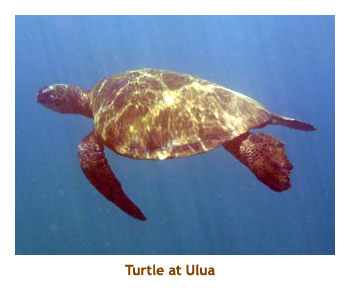 The snorkeling was very good and we saw lots of turtles. 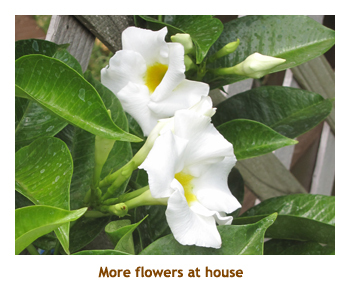 We came back to the house to de-salt and then headed off to Kahului for the day. We got to Kahului in time for the tail end of the big flea market (arrived at 12:30, closed at 1:30). It was a huge market, held weekly. Parking was 50 cents! There were lots of booths selling vegetables and crafts (and it was hot!). 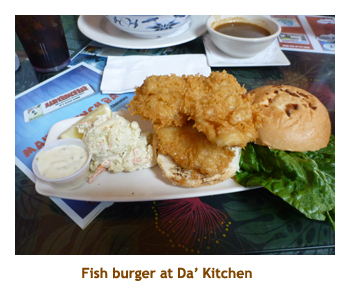 We went for lunch at Da' Kitchen. It was good "local" food and huge servings. 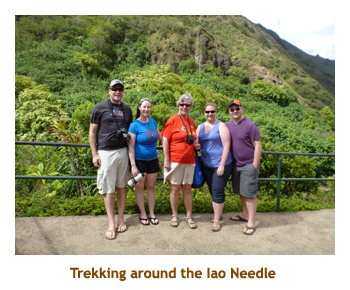 Afterwards we drove through Wailuku to the Iao Needle. It was a bit misty and cooler, and it even rained a bit. That was most welcome! 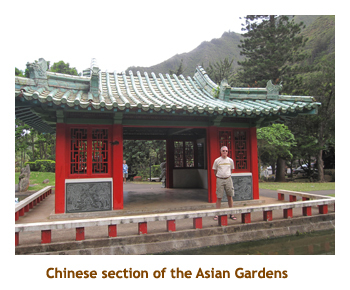 We walked around the gardens and then stopped at the nearby Asian Gardens. We were back home again by 5:00. We had been planning to BBQ some steaks (the house owner had donated them) but we all still felt the effects of the huge lunch so we just had something light. We played some Sticks and then headed to bed. 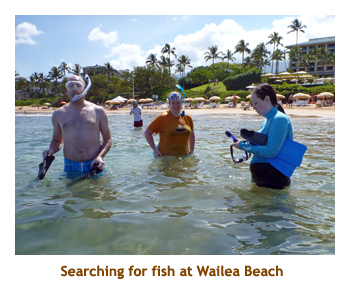 We were up early again, had breakfast and headed off to Wailea Beach for our daily snorkel. 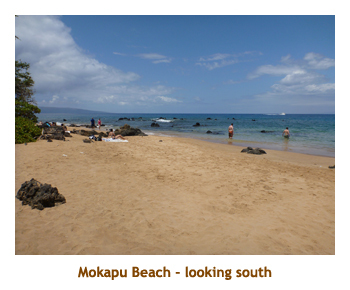 It was a beautiful beach and the snorkeling was OK. We had lunch at Maui Tacos (not far from the house). 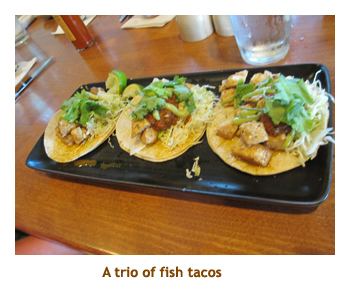 I had been trying to find Alexander's fish place and asked the waitress at Maui Tacos. I knew it was nearby, but it turned out that Alexander's had closed and Maui Tacos was in the same location. Just down the road was a shave ice booth - just in time for dessert. We spent the afternoon back at the aquarium. The shark feeding is really interesting. 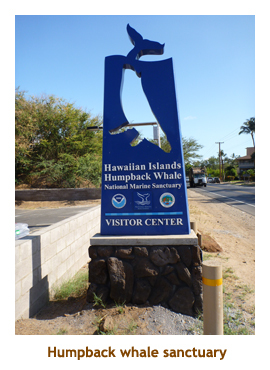 While we were there we booked with Pacific Whale Foundation for a snorkel cruise to Molokini and Lanai, a couple of days hence. We were back home by mid-afternoon and read for a while. Later, Matt cooked us up some steaks on the BBQ for dinner. For our evening entertainment we played some Power Grid. Once again we were up early (still on Calgary time? 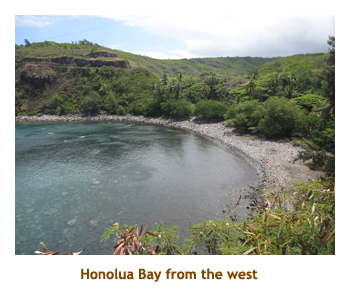 ), had breakfast and headed up to the north tip of West Maui to Honolua Bay. 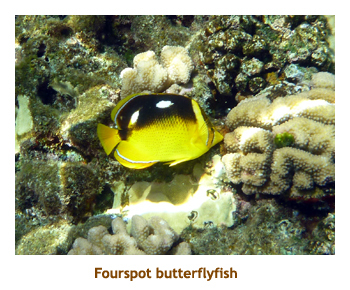 This has been our favorite snorkel spot on the island since we discovered it in 1980. From the "parking lot" (roadside parking) there is a wooded trail to the beach. The beach has no sand - only large rocks and boulders - not the easiest for getting around. 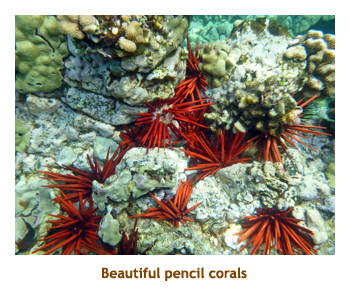 However the snorkeling is wonderful. 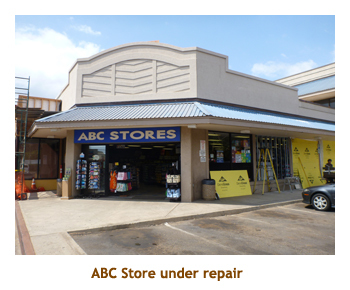 Afterwards, we continued driving around the north tip of the island to Kahului. The road is only single wide in places so we were lucky not to encounter much oncoming traffic. We stopped along the way at a house selling "the world's best banana loaf". It was very good! 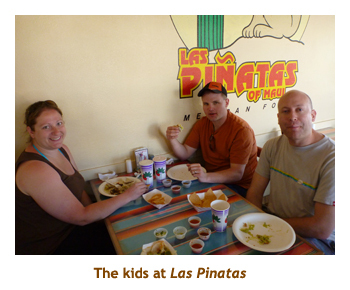 We stopped in Kahului for lunch - the kids ate at Las Pinatas (spicy!) and Marjorie and I at nearby Marcos for wraps. While in Kahalui we visited Wal-Mart and then headed for home. We played Power Grid in the late afternoon (Stacy, Chrissy and I) and then had leftovers for dinner. 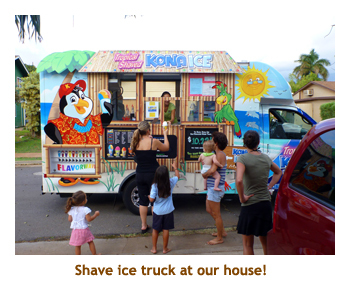 Right around dinner time we heard the ice cream truck tune and sure enough the shave ice truck pulled up in front of our house. It was tempting, but we resisted. Another early night. We were up early for our day trip to Molokini. This would be the 4th time we had done this trip over the years. 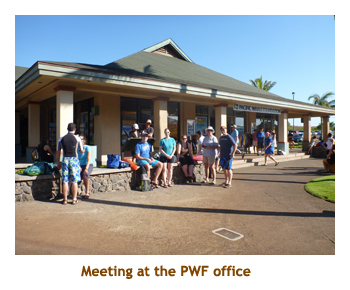 We breakfasted , packed our snorkel gear and headed off to the Pacific Whale Foundation office by the Maui Ocean center. It was a beautiful calm day at Ma'alaea Harbour. The water looked like a mirror! Our check-in time was 7:45 and we boarded the Odessy ready to sail by 8:30. They served fruit and muffins as we headed down the coast towards Molokini. We arrived at the sunken crater about 9:00. We were given an hour to snorkel back and forth along the rim of the crater. The fish were amazing. 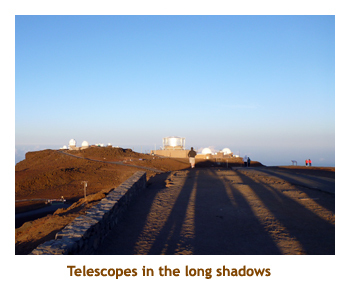 Then we headed north to Lanai - about 1.5 hours away. 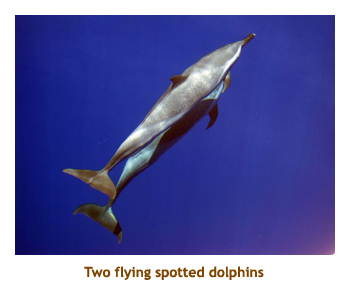 When we were almost to the snorkel spot off of Lanai, we ran into a pod of playful spotted dolphins. The water was so clear, without a ripple, that the dolphins appeared to be flying through the air. What an amazing sight! Lunch was then served (burgers, etc) as we approached Lanai. Again we had a 1 hour snorkel in a coral garden. 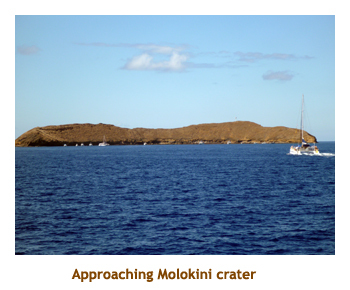 It was another 1.5 hours back to Ma'alaea Harbour and we docked about 3:00 PM. What a wonderful day! 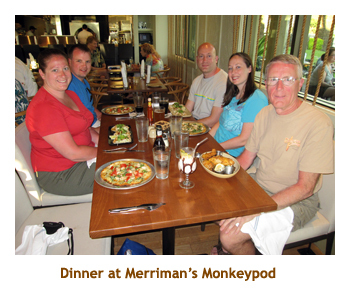 We drove home to clean up and then headed to the Monkeypod in Wailea for dinner (one of Merriman's restaurants). It was excellent. Finally it was back home for a game of sticks. Today we actually slept in! We had breakfast and then Marjorie and I went out to do some grocery shopping and take a load of drink cans to the recycling center. Back at the house we had decided to do different things. Marjorie wanted to stay home for a bit, C&M wanted to go shopping. 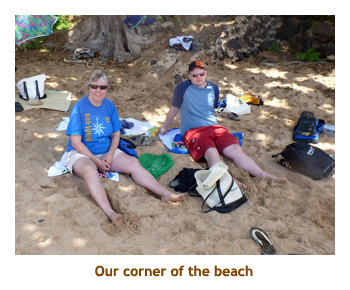 So, C&M dropped M&S and me off at Mokapu Beach to snorkel while they shopped in Wailea. The snorkling was very good. 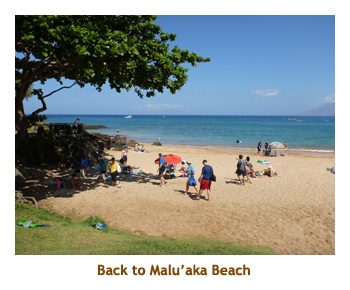 The beach is right beside Ulua Beach and we actually snorkeled over to Ulua and back. We were back home again in time for lunch. 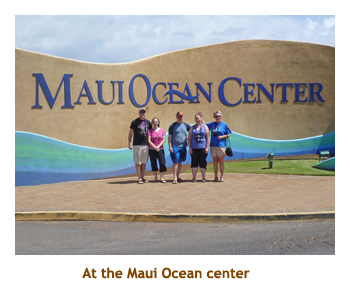 Then we all loaded into the van for an afternoon at the Maui Ocean Center. Once again we were in time for the shark feeding demonstration. Back at home, C&M and I played Power grid while others read or computered. We had dinner at home, BBQ'ing some hamburgers. Afterwards we played "Up the River". Back to being up early again. 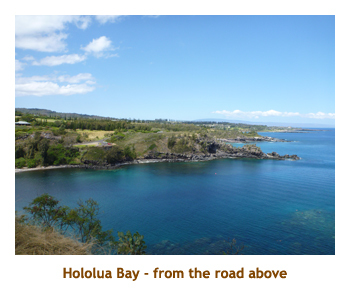 Had breakfast and then headed south to 'Ahihi Bay for a snorkel. 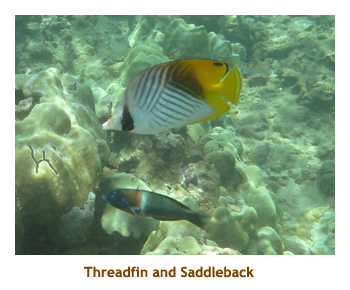 The snorkeling was good but not great. The kids had brought along their boogie boards, so we moved over to the next beach (Onaloa Beach) which had some good surf. We spent about an hour there so that the kids could catch some good waves. Then we headed back home for lunch. 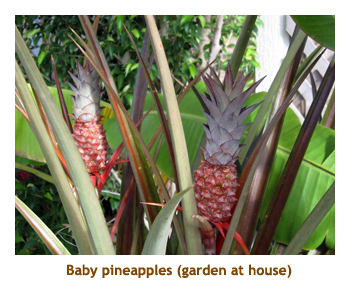 For the afternoon, we drove twards Haleakala and stopped at the village of Pa'ia. It is quite a tourist town and had some interesting shops. The we headed up the road to Haleakala looking for the Surfing Goat Farm. 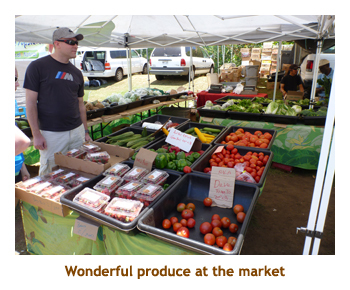 Someone had read about this farm and perked our interest. 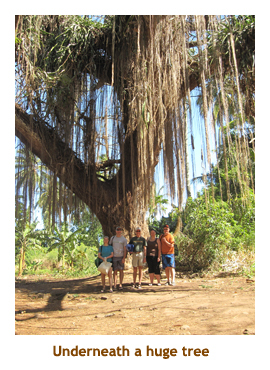 We got to the village of Pukalani and then had to ask for directions. We finally found the farm on a sideroad. There were surfboards and goats all over! The owners were from Germany and converted all of the goat milk into a large variety of cheeses. 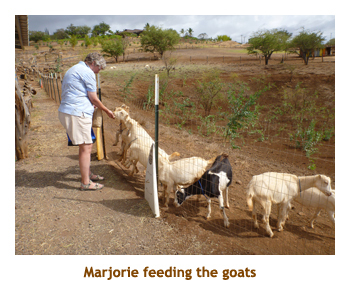 After feeding some of the goats, we bought some cheeses and then continued down the sideroad into Kahului. Of course we had to visit Ululani's for shave ice. 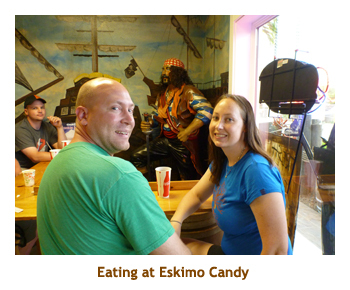 We were back home in Kihei by 5:00 and decided to have dinner at the Eskimo Candy Restaurant, which was nearby. It was good. 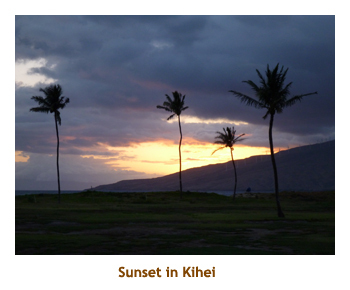 On the way home we stopped at a beach in Kihei to check out the sunset. Afterwards we spent the evening playing "Up the River" (again!). 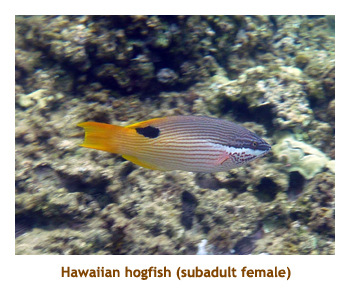 Day 10 (May 18) - Malu'aka and Maui Brewing Co.
Today we decided to revisit Malu'aka Bay for a morning snorkel. 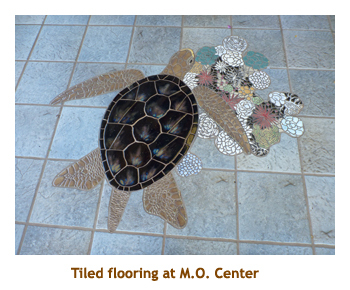 We had seen lots of turtles there earlier. Once again it was a great snorkel. Lots of turtles and fish. Then it was back home to desalinate and have lunch. We decided that we would visit Lahaina today. 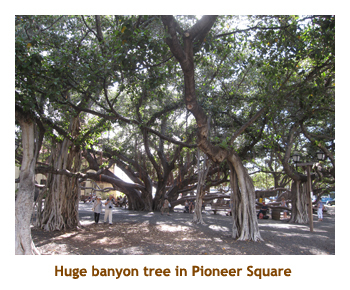 After driving up the west coast to Lahaina, we parked and wandered around the town. Lots of interesting shops! 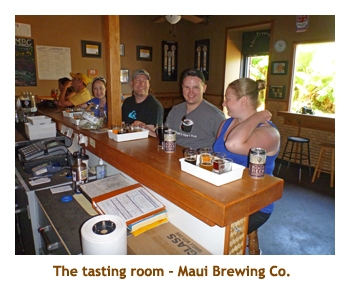 We made our way to the Maui Brewing Company and signed on for a tour and tasting. They make quite a selection of beers. The tasting was quite generous and the kids really liked the Coconut Porter. 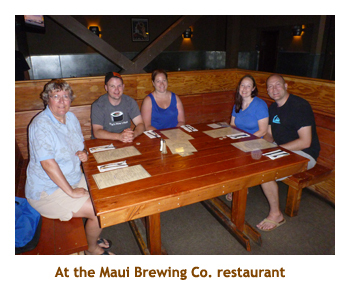 Included with our tasting was a savings coupon for their restaurant, so we drove up to Kahana and had dinner there. Then it was back home to Kihei for a game of Power Grid. Whoa, we were up early again. And it was another beautiful day ahead. 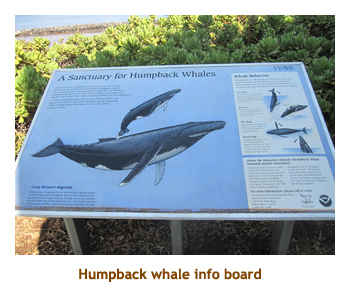 Marjorie and I headed off for a pre-breakfast walk to the nearby Humpback Whale Center. We had seen the sign from the street so were interested in what it was all about. We were past the whale season, so there wasn't much going on there. 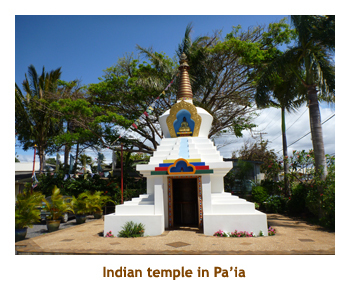 We wandered around the site and a lady told us of the damage done by the 2010 tsunami. 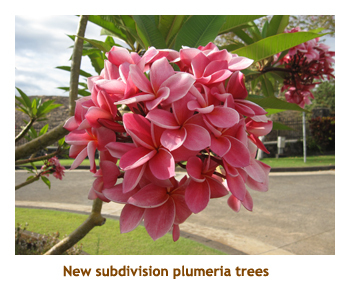 They had relandscaped the property to better deal with a future tsunami. We walked back to the house and then headed out for breakfast with the kids - to the Kihei Cafe. We had read about the cafe and driven by it, and it is very popular. I had mac-nut pancakes - delicious! Then we headed south for a snorkel at Chang's Beach. There were lots of turtles there. We were back home for lunch. For whatever reason, we didn't go anywhere for the afternoon. Instead we played Power Grid and read our books. Just a relax day! For dinner we went to Fat Daddy's BBQ in Kihei. It was very good. Back at home we finished the day with a game of Hand & Foot. 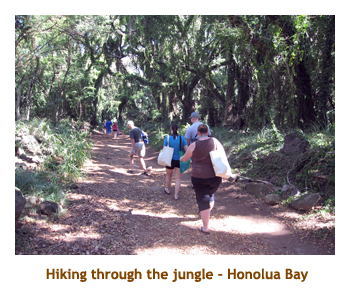 Today we were repeating ourselves and headed to Honolua Bay again. We had breakfast and then drove north to our favorite snorkel spot. 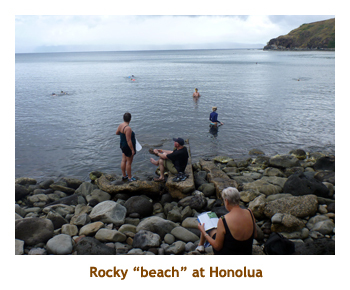 There were lots of people there, all obviously avid snorkelers as the bay is really out of the way and the beach is nothing but large rocks. After a wonderful snorkel, we drove back home to Kihei. 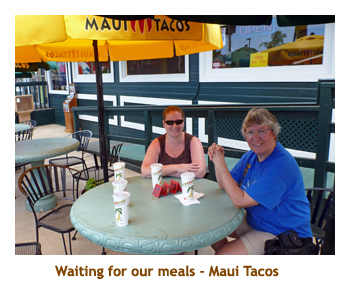 We had lunch at the house and then headed off to Kahului for a Costco run. After flexing our Amex, we headed back home with our purchases. 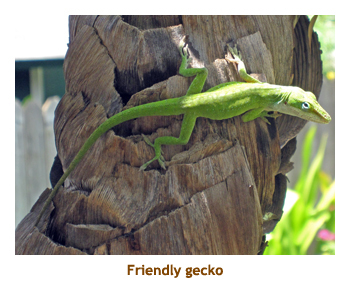 We read and relaxed for a while and then drove south to Wailea and the Monkeypod restaurant. They had cheap drinks and food if ordered before 5:30. We really enjoyed the restaurant both times we ate there. After dinner we walked through the small outdoor mall surrounding the restaurant. There was a new subdivision right beside the mall that was just prepared lots so far - no houses yet. I bet they were expensive! 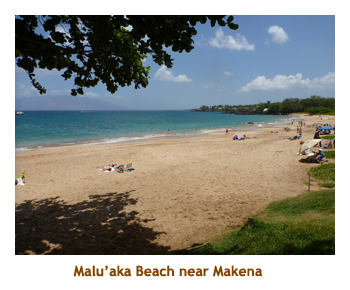 After dreaming about our new house on Maui, we headed back to Kihei for a game of "Up the River". We woke up to another beautiful day. We had breakfast as usual. 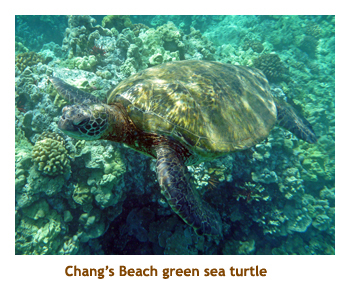 We decided to try snorkling at the beach next to Chang's Beach. I never did find out the name of the beach. We saw lots of turtles there. After our snorkel we warmed up on the beach and then headed home to cleanup and have lunch. 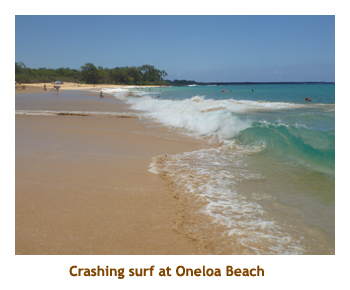 The kids wanted to try boogie boarding again so we packed our stuff and headed down to Oneloa beach where there were some nice breakers rolling in. The kids had a great time with the waves. Then it was back home again to read and relax for the afternoon. 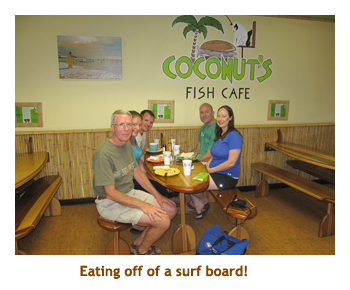 For dinner we went to Coconut's Fish Cafe where all of the tables and benches were made from surfboards. I had fish tacos there and they were really good. We returned to the house to play some Hand & Foot. 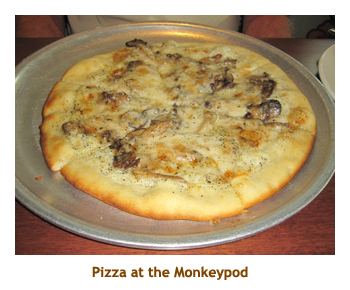 About 9:00 or so the kids left us and drove down to the Monkeypod in Wailea for cheap pizza and beer. They seemed to have had a good time there. Today was the worst day of our holiday - yes, it was time to go home. I always find Hawai'i to be the toughest place to leave. I love it there! Once again we had a late evening flight, so we had the day to enjoy Maui. The owner of the house let us stay as late as we wished. Marjorie and I were up early so we took the recyclables to the transfer station. On the way back we stopped at the post office as Marjorie needed some US stamps. We picked up the kids and headed to Polo Beach for a snorkel. 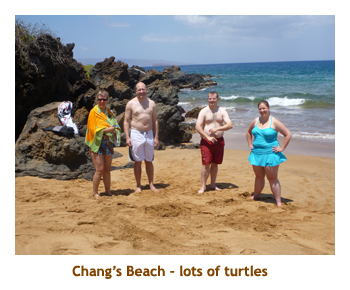 However, the snorkeling was crappy there so we moved to Chang's Beach to see the turtles again. 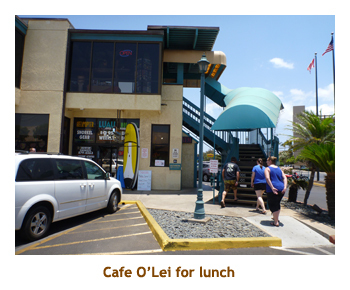 We had lunch at Cafe O'Lei. Then it was back to the house to relax before the flight. We left for Kahului about 4:30 PM. 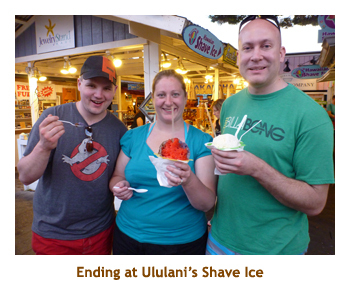 Arriving in Kahului in good time, we stopped in at Ululani's for shave ice. 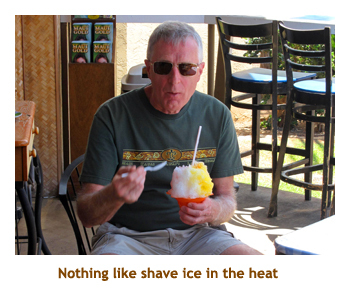 It was the best shave ice we had found on the island. We hit the airport (and returned the van) by 5:30 and had dinner at Burger King. Our first leg was at 8:30 and we arrived in LAX at 4:30 AM. We changed terminal buildings and caught the 7:30 flight to Calgary. We arrived home about noon. It had been a wonderful trip.